Looking for a completely remodeled home in fabulous location? This amazing home has been renovated to the studs. Updated HVAC, Roof, windows, electric and a magnificent interior remodel. As you pull up you will pleased to see classic vinyl exterior with black shutters and a new mission style door. The wide plank handscraped flooring is featured through most of the first floor of the home. The flooring is a great color and is very versatile it is even waterproof. The entire home has decorator painted walls in todays greige with crisp white trim. The formal living room has an abundance of light from the recessed lighting and the bay window. The living room is open to the dining area for ease of entertaining. The open concept and expansive kitchen is what all the buyers want today. The crisp white kitchen has an abundance of cabinets and counter space. The sparkling quartz counter tops are featured on the oversized island and on all of the counters. The oversized island is great for meal prep and additional seating. The subway glass backsplash compliments the quartz counters. The stainless refrigerator will be installed. The stainless steel gas stove, dishwasher and microwave make meal prep a breeze. The family room is located behind the gourmet kitchen and has plenty of room for a large TV and sectional or sofa and love seat. The slider leads to the private yard and patio. The powder room is adjacent to the family room and features a great looking gray cabinet base with white sink and matching mirror. The first floor master bedroom is ideal! The bedroom is nicely sized with fresh carpet. The full master bath has double sinks and a fabulous looking cabinet base. The oversized shower has custom tile surround and flooring throughout the bath. The first floor has all 5 inch baseboard trim. The 2nd floor has all newer carpet and has been freshly painted. The 2 bedrooms are very nicely sized and have a gorgeous updated bath between them. The main bath has a tub, rich ceramic floor tile and tub surround and a white cabinet base. All the doors have been replaced with 6 panel doors with nickel hardware. The setting of the end unit is terrific as the home is set to allow for a nice side and backyard. The community is in a great location for shopping, and commuting to Phila. Voorhees has highly acclaimed schools. 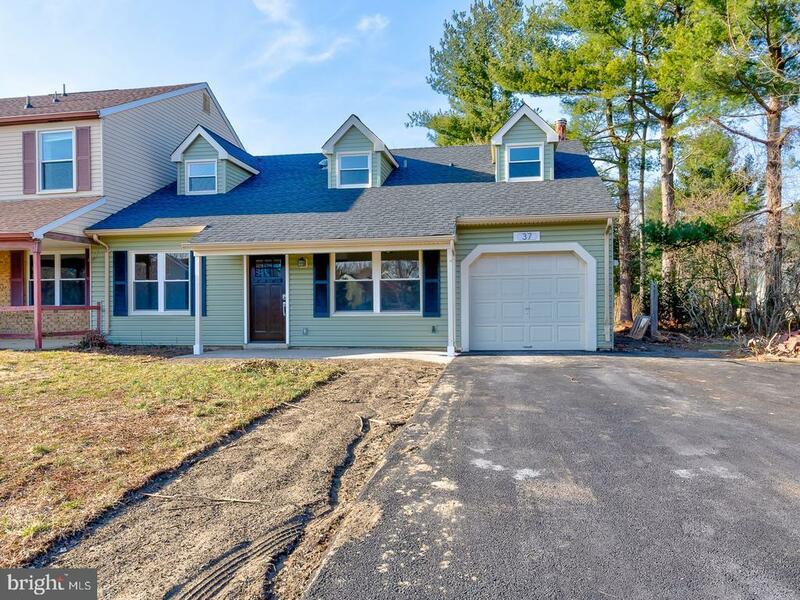 This is move in ready and shows like new construction.